Bittersweet Chocolate Tart….Best Chocolate Tart Ever! Two years ago I made this dark chocolate tart and we ate it around a bonfire. Someone had the bright idea of putting toasted marshmallows on their slice. Last Saturday I made the same tart but gluten free and we made sure to have plenty of marshmallows to toast and top our slices with. Most of us had seconds, but I was able to save a tiny sliver for my mom to enjoy. It was a big hit with all of the chocoholics there so here is the recipe. Bake at 350 for 11 or 12 minutes. Let cool while you make the filling. Put the milk, heavy cream and chocolate in a heavy bottomed sauce pan and heat on low to moderate heat; stir often until chocolate is melted. Remove from heat and cool a few minutes. Add the beaten egg, blend well. Pour into the tart pan and bake at 375 for 15 minutes. Thanks! 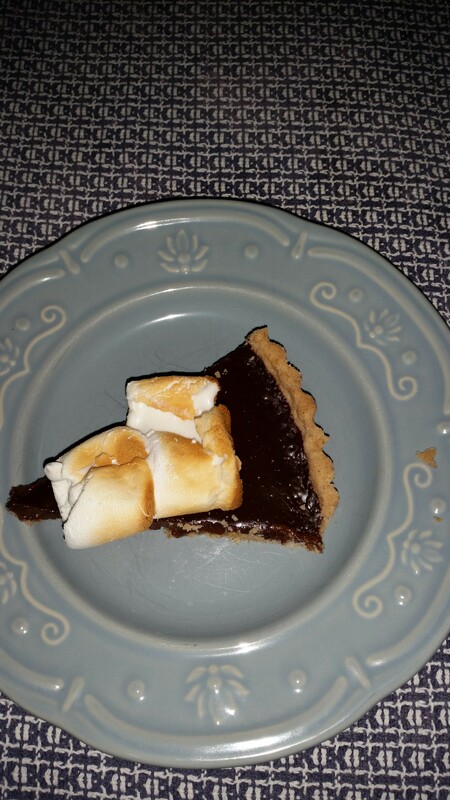 It is sort of like a s’more tart only more sophisticated and even tastier!